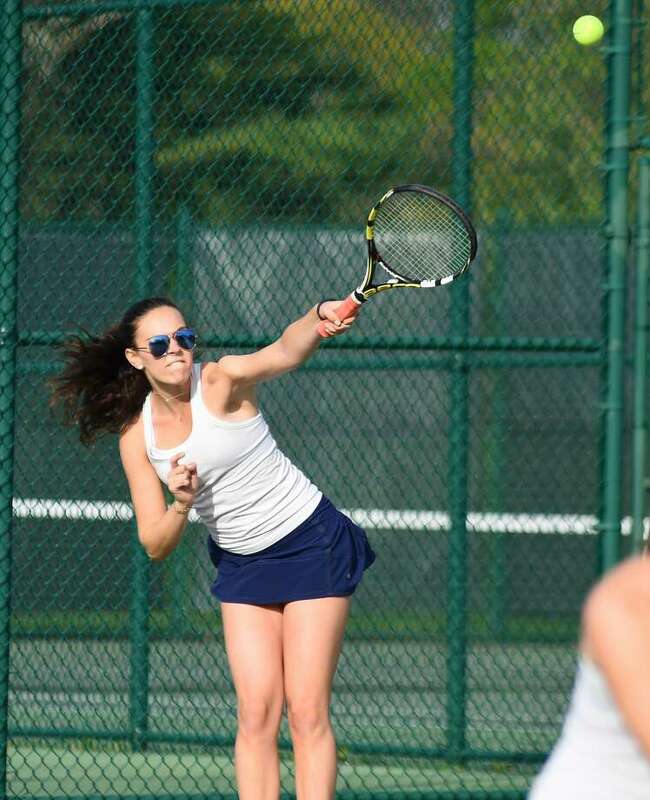 Seniors Blaire Marine of Darien (left) won 8-3 in her doubles match against Master's School on Friday, May 12. The Greens Farms Academy baseball team ended its season with one of its biggest victories in years, notching an 8-2 victory over perennial FAA power Brunswick School in Greenwich on Friday afternoon. Mack Muller (Westport) was 3-for-4 with a double and 2 RBIs while Tim Mira (Stamford) was 2-for-3 with an RBI. Sean Hogan (Westport) had a double and two RBIs while James Velgot (Weston) had a hit and an RBI. Velgot also had the defensive play of the game, robbing a Brunswick player of a home run. Michael Canning (New Canaan) pitched four innings, striking out three with a walk. He gave way to Mira, who earned the win in relief, while Peter Donovan (Old Greenwich) capped off the game. Earlier in the week, Hogan went six innings, striking out five as the Dragons fell 5-3 in another tight loss to Rye Country Day. The Dragons trailed 9-2 entering the seventh inning, but Lucy Nelson (Westport) hit a grand slam in the gap and made a game of it late in the defeat. The Dragons threw a balanced scoring attack at King, but defensively just couldn't stay with the Vikings and dropped its regular season finale. Liam Murphy (Westport) led GFA with three goals while Ethan Haas (Darien), Charlie Benson (Darien) and Will Byrne (Darien) scored two goals apiece. Zach Liston (Wilton) scored once and helped set up four other tallies while Ian Epps (Darien) also scored and David Hoffman (Westport) had two assists. Goalie Ryan Pilkington (Weston) made seven saves. Earlier in the week, GFA lost to Brunswick by a 13-7 score. Byrne scored four times against the Bruins while Ryan Caione (New Canaan) added three. Liston added an assist.